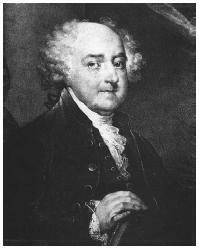 John Adams achieved prominence on many levels—as jurist, statesman, and as the second president of the United States. Known for his sharp diplomatic skills, his flair for words, and his spirited activism, he was an instrumental figure in forging the fledgling nation that would become the United States of America. Adams was born on October 30, 1735, in Braintree (now Quincy), Massachusetts, the son of a farmer. His parents encouraged him in his studies, and pushed him to enter Harvard College to study for the clergy. Upon graduation in 1755, the strong-willed Adams instead decided to teach and study law. He was admitted to the Boston bar in 1758 and established a prestigious legal practice. During the pre–Revolutionary War years, Adams spoke out strongly against many acts enforced by the British government, including the Townshend Acts, which unjustly taxed items such as glass and tea. He also joined the Sons of Liberty—a group of lawyers, merchants, and businessmen who, in 1765, banded together to oppose the Stamp Act. From 1774 to 1778 Adams served as the Massachusetts representative to the Continental Congress. He entered the judiciary during this period and rendered decisions as chief justice of the Superior Court of Massachusetts from 1775 to 1777. In 1776, he signed the newly created Declaration of Independence. After the war, Adams entered the field of foreign service, acting as commissioner to France in 1777. In 1783, Adams went to Paris with John Jay and Thomas Jefferson to successfully negotiate the Treaty of Paris with Great Britain, which officially ended the Revolutionary War and established the United States as an independent nation. In 1785, Adams became the first U.S. minister to Great Britain. Adams returned to the United States in 1788 and began service to the new government with his election to the office of vice president of the United States. He was the first person to serve in this office and was reelected for a second term in 1792. In 1796, Adams was elected president of the United States. He was the second man to hold this position, following the retirement of the first president, George Washington. During his term of office, Adams advocated naval strength; approved the Alien and Sedition Acts of 1798 (1 Stat. 566, 570, 577, 596), which increased the restrictions concerning Aliens and imposed harsh penalties on any person who attempted to obstruct the government system; averted war with France; and selected the eminent John Marshall as chief justice of the U.S. Supreme Court. In 1800, Adams ran for the presidency for a second term but was defeated by Thomas Jefferson. Adams's political and personal Jurisprudence was characterized by intense nationalism; some consider him the most influential designer of the new nation's government and identity. A Federalist and a realist who spoke his mind without consideration for political fallout, Adams believed that unchecked power created abuse even in the best of democracies. To that end, he was the most significant advocate for the creation of a balance of powers through a tripartite government: a bicameral legislature, a strong executive, and an independent judiciary. He also authored the state constitution for the Commonwealth of Massachusetts, which remains the oldest functioning written constitution in the world. Adams published a number of political treatises, including Thoughts on Government (1776) and Defense of the Constitutions of the United States of America Against the Attacks of Mr. Turgot (1787). John Adams sought a written constitution based on unwritten Natural Law. He believed that the Common Law was the source of unalienable, indefeasible rights of men, the honor and dignity of human nature, the grandeur and glory of the public, and the universal happiness of individuals. John Adams was also a devoted family man. His wife, Abigail, was a vivacious and witty first lady who openly commented on politics and issues of the day. There were five Adams children, including John Quincy, who served as the sixth president of the United States. John Adams died on July 4, 1826, in Braintree. Allen, Brooke. 2002. "John Adams: Realist of the Revolution." The Hudson Review (spring) 55. McCullough, David. 2001. John Adams. New York: Simon & Schuster. Ryerson, Richard Alan, ed. 2001. John Adams and the Founding of the Republic. Boston: Massachusetts Historical Society. Thompson, C. Bradley. 1998. John Adams and the Spirit of Liberty. Lawrence: Univ. Press of Kansas. As unlikely a modern hero as John Adams, John Quincy recently had his moment of celebrity with the simultaneous appearance of a critically acclaimed biography by Paul Nagel and a starring role in the Steven Spielberg film Amistad. A very weak Kidderminster suffered a shock 4-3 defeat by Worcester Norton whose scorers included Chris Adams, John Wold and Jerry Ogle. Sir Francis Walsingham created The Queen's Men in 1583, in consultation with Edmund Tilney, Master of the Revels, by skimming off the best actors at work in other acting companies, including Richard Tarlton, Robert Wilson, John Adams, John Bentley, John Singer, and John Lanham. Zany McBlain has become a household name throughout Ulster for his uncanny impressions of politicians like Dr Paisley, Gerry Adams, John Hume and the sing-a-long Free Presbyterian minister Willie McCrea. Connecticut Huntington, Samuel Sherman, Roger Williams, William Wolcott, Oliver Delaware McKean, Thomas Read, George Rodney, Caesar Georgia Gwinnett, Button Hall, Lyman Walton, George Maryland Carroll, Charles Chase, Samuel Paca, William Stone, Thomas Massachusetts Adams, John Adams, Samuel Gerry, Elbridge Hancock, John Paine, Robert T.
I submit that this is not true, that we hear far too much of the ilk of Linda Wertheimer, Cokie Roberts, Susan Stamburg, Noah Adams, John Itski, and their studied ignorance of structural understanding, and that college radio can, in lieu of NPR, actually produce in-house better if less finished programs - and can also obtain material from such sources as Pacific and FAIR that is more intelligent, thoughtful, and balanced. As the son of John and Abigail Adams, John Quincy carried a sense of his own inescapable destiny. Since its founding by John Adams, John Hancock, James Bowdoin and other scholar-patriots, the American Academy of Arts and Sciences has elected leading "thinkers and doers" from each generation, including George Washington and Benjamin Franklin in the eighteenth century, Daniel Webster and Ralph Waldo Emerson in the nineteenth, and Albert Einstein and Winston Churchill in the twentieth. In a letter to Mr Adams, John Evans said the behaviour of chief executive Bryn Parry-Jones had left him no alternative but to quit in May. Of course, they're all covers, but when you're playing songs written by the likes of Ryan Adams, John Hiatt, Kris Delmhorst, Martin Sexton, Peter Mulvey and my two personal favorite living songwriters, Tom Waits and Jeffrey Foucalt, it's kind of hard to go wrong. With Julie Adams, John McIntire, Nancy Gates and Richard Anderson.